With childhood obesity and cholesterol levels on the rise, making decisions on how to pursue healthier lifestyle choices should include the oils you and your family use in your daily lives. When it comes to oils, there are several choices; whether the oil is used for baking, cooking, marinating, flavoring or garnishing determines if it is the best choice. For example, when baking, healthier choices include coconut and palm oil, but high-oleic safflower and sunflower oil are the overall best for this purpose. Although we should avoid frying foods, I recommend avocado, palm and sesame oil when doing so because they stand up so well to high temperatures. When sauteing, these choices also work great. For dips, dressings, marinades and garnishes, use flax, olive, toasted sesame or walnut oil. Cooking oils are generally extracted from one the following: seeds – safflower, sunflower, sesame, etc. ; fruits – avocado, apricot (kernel), olive, palm, coconut, etc. ; nuts – almond, hazelnut, peanut, walnut, etc. ; and vegetables – corn, soybean, etc. The most common method for extraction is to clean, grind and then press the oil from the source (plant, seed or fruit), but there are a few special cases that involve squeezing the oil straight from the flesh of the fruit of the plant. Here are some of the healthier choices to use when preparing food, particularly when cooking. 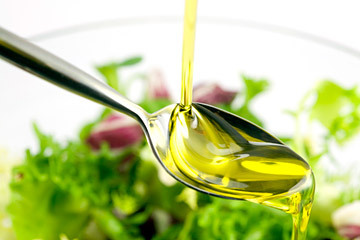 Produced by pressing the flesh of olives, this oil has become known as the healthy cooking oil, and it certainly is. Compared to vegetable oil, olive oil should be considered a vast improvement. This particular plant oil is one of the few cooking oils that contains about 75 percent of its fat as oleic acid (a monounsaturated, omega-9 fatty acid). Many households use corn oil or vegetable oil, but research has shown by replacing that choice with olive oil may lead to a significant decrease in total blood cholesterol and an improved LDL:HDL ratio. This oil is one of the best choices to use as a salad dressing and a great sauté option, but not a good choice for frying or baking. One downside is its tendency to degrade in a very short amount of time, especially if stored in a warm place (like a kitchen). In just a month or so, stored olive oil will begin to break down and eventually go rancid. You can tell if olive oil has gone rancid by smelling it. If it has a stale smell, like old peanuts or putty, then discard it. Coconut oil is an edible plant oil pressed from the fruit of the palm tree, and is ideal for light fare and subtly flavored dishes. While olive oil is well-known as the “healthy” oil, this choice is comparable. Once considered a fatty and unhealthy choice, research by Bruce Fife, ND, and others suggests it’s actually quite the opposite. While coconut oil does in fact have a high fat content, the fatty acids are classified as medium-chain fatty acids (MCFAs), while most of the fats in our diet come from long-chain fatty acids. Parents need to know that medium-chain fatty acids are more easily digested, preferentially used by the liver to produce energy and the kind of fats found in breast milk. A typical concern for those unfamiliar with using this oil is whether it will affect the flavor of the food. The oil itself is very light and does not have a strong or clingy flavor, so there is no concern that it will overpower or affect the taste of the food being prepared. A further benefit of this antioxidant-rich cooking oil is that it has an impressive shelf life, especially when compared to olive oil. As a side note, while coconut oil is beneficial from a health perspective, there isn’t enough research at this time to determine whether having a coconut allergy also means an allergy to coconut oil. Investigate if your children are the rare few who have a coconut allergy before preparing food using coconut oil. There are two additional oils to consider in terms of healthy cooking. Avocado oil is more than 50 percent monounsaturated and a heart-healthy choice, particularly good in salad dressings and when sauteing. Though this oil is also one that has been suggested as a great option for frying (because it can tolerate the higher temperature), staying away from any frying is always the prudent choice. Grapeseed oil, a byproduct of the wine-making industry, is another healthy alternative for salads, served with raw veggies and in dips, sauces and salsas. When considering the number of cooking and dressing oil options that are beneficial to your family’s health, there are plenty of reasons to avoid those that aren’t. For instance, vegetable oil isn’t going to match up to these other cooking oils when it comes to measurable beneficial nutrients. So, when the opportunity arises, make another healthy lifestyle move by incorporating these healthy cooking oils into your diet.